Nicola Lorusso: One guy's color dries, another guy's wound dries. 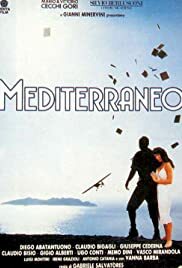 "Mediterraneo", which we saw during its debut run locally, has stayed fresh as when we first saw it. This small, endearing film has a lot going for it. In fact, it makes a perfect statement against WWII, or any war, for that matter, without being in one's face. The subtlety of this film stays long in the viewer's mind. 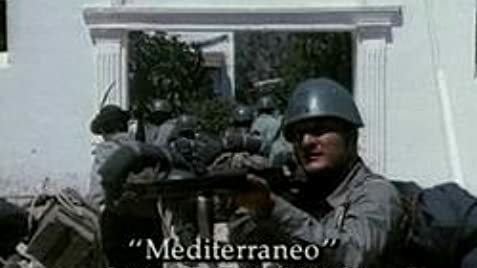 We are presented a group of Italian soldiers on a mission to set a base in a small, and apparently uninhabited island in the Aegean Sea, not too far from Italy, but millions of years away in the way it has stayed primitive enough to offer anything to these men. As soldiers, under the command of Raffaelle, these are not the typical professional soldiers. In fact, these men discover themselves and a world they didn't know existed during their time in the island. What surprises the soldiers is not to encounter anyone living in the village facing the sea, where they disembark. It becomes clear everyone is hiding from them. When the populace discover these men are harmless they return and embrace the invaders with open arms. After all, they feel the Italians share a lot in common with them. The men, obviously abandoned, and lacking means of transportation, get stuck in the island. In fact, they don't realize, but when the Italian aviator arrives in his one engine plane, he is amazed how many years have passed since they arrived at that remote spot. This small film is a delight to watch. Diego Abatantuono makes a great Lorusso. Claudio Bigati, is Raffaele, the man with an artistic eye, who sees the beauty of the classical Greek design. Vanna Barba plays Vassilessa, the local whore who falls in love with the shy Farina(Giuseppe Cederna). The rest of the cast does a good job under Mr. Salvatores' direction. Watch this film as it will delight fans of Mr. Salvatores and the Italian cinema.